Churchill on Poland: It is a mystery and tragedy of European history, that a people capable of every heroic virtue, gifted, valiant, charming as individuals, should repeatedly show such inveterate faults in...their governmental life.. The official racist and anti-Semitic policy of the current Polish government calls for full-weight all-spectrum sanctions against Poland in the diplomatic, humanitarian, educational, cultural, trade and military spheres. The year of the 75th anniversary of the Warsaw Ghetto Uprising, the day on which Israel and many Jewish communities worldwide commemorate as Yom Hashoah, the Holocaust and Heroism Remembrance Day, has begun with a sobering show of Poland's’ official anti-Semitism. The notorious law aiming to censor the narrative of WWII and Holocaust with regard to Poland was passed by the Polish Sejm on January 26th, 2018, on the eve of International Holocaust Remembrance Day, with a smashing victory. 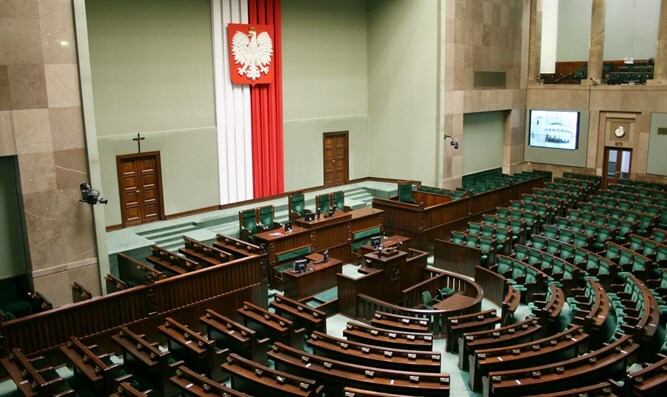 The Polish opposition preferred to abstain on this vote leading to a surreal figure of 116 abstentions, nobody against, and two for the law. -Five days later, on January 31st, despite international alarm, the Senate of the Sejm passed the law into force by a prevailing majority of the senators, 57 out of 100. -Six days after that, on February 6th, despite powerful, widespread and united international outcry, the president of Poland Mr Duda signed the law, delivering the pathetic speech of a nervous child who knows he did something bad but would never admit it. -Three days after that, on February 9th, 2018, Robert Winnicki, far-right Polish nationalist, member of the Sejm and head of the National Movement, attended the party thrown at the Iran Embassy on the 39th anniversary of the Iranian revolution, taking photos with the Iranian Ambassador to Poland. This 33-year old extreme Polish nationalist is now preparing the official exhibition on “the Jews who murdered Poles” as he refers to the exile of Poles (many of those exiled were Jewish, but that does not matter to this MP) to Siberia by the Soviet authorities, a process which he insists, in his capacity as Polish legislator, ‘has to be legally qualified as a ‘Holocaust’.“ This MP is one of the most vocal advocates of the notorious law on the Holocaust, and it is really worthwhile to hear his fervent speeches in connection with the law where he argues that “Poland has to deal frequently with Arab countries”, and urges the Polish government ‘to get off your knees before Israel”. It all is on record, in the official documents of the Polish Sejm. -On February 7th, a document appeared on the official site of the Polish Senate, the Upper Chamber of the Parliament. In both a video message and letter, in which the Senate’s Marshal, the highest official of Senate, appealed to the Poles living abroad. There are an estimated 20 million people living in the Polish diaspora today. A quote from the Marshal’s appeal: “I am asking to document and respond to manifestations of anti-Polandism, unfair wording and opinions. I am asking to notify our embassies, consulates and honorary consuls about slander violating the good name of Poland. [...] I call for organizing seminars, exhibitions, meetings, sending letters, for undertaking activities aimed at effective admonition for historical truth. I am also asking you to use your good, long-term cooperation with representatives of your national authorities, self-government authorities, social organizations, including other national minorities, to promote reliable knowledge about Poland and Poles. Sincerely, Stanisław Karczewski”. Basically, the third highest official of Poland is instigating about 20 million people to become informers to the current Polish state and to actively participate in the Polish state’s new measures abroad.The Orwellian reality is the current Polish reality, and KGB methods are now being put to use, - as is written in the official letter of the Marshal of the Polish Senate. -At the same time, two more laws were acted upon by the Polish parliament. In mid-February 2018, the Polish Sejm prepared to vote on the new law restricting the export of kosher meat from Poland. This law, if accepted, would affect not only working places and the economy, but the human rights of consumers of kosher meat across Europe, because Poland today is one of the largest exporters of kosher meat. How is the reason for accepting such a law phrased by the Polish legislators? - kosher slaughter is termed an “unnatural death of animals”. Nice to hear how humane Poles can be to animals, especially to the animals of others. -At the same time, in February 2018, the ministry of justice of Poland decided ‘to re-examine' the restitution law which was supposed to come to a vote in the Sejm. This effectively means the bill is frozen for a substantial time. The law in question is a mockery of a law, actually, because of many of its deliberately twisted positions; but even that very bad law had been used by Polish legislators and the government against Israel and international Jewish organisations in the ongoing dispute around the Holocaust law. Poland and Bosnia-Herzegovina are the only two European countries that ‘have failed to enact any comprehensive legislation covering property taken from Jews during the Holocaust and Communist eras, according to the Holocaust Immovable Property Restitution Study completed by the European Shoah Legacy Institute in April 2017. Given the figure of 3,47 million Jews, 3 million of whom were exterminated, and their property of every kind appropriated by their best-friend Polish neighbours and the Polish government from 1939 onward, this is a travesty. The Polish state today, 73 years after the end of the WWII and 29 years after their post-Soviet independence, thrives on massive seized property as it were entitled to it. Poland as a country, and many Poles as its citizens, shamelessly lived in and on illegally and inhumanely seized Jewish property in a phenomenon widely known in Poland as the use of ‘abandoned property’ - as if it had been abandoned by someone of their own will..
Poland as a country, and many Poles as its citizens, shamelessly lived in and on illegally and inhumanely seized Jewish property in a phenomenon widely known in Poland as the use of ‘abandoned property’ - as if it had been abandoned by someone of their own will.. 73 years of use clearly makes the use of the seized property belonging to other people and organisations feel as if it is one’s own - as Poland demonstrated all those years, and as it still demonstrates today - shamelessly. The Polish government brought to power by the PiS party in 2015, is not new to controversies on the Holocaust. There were several ‘opinions aired previously by its ministers which justly caused international outcry and denunciation. -in a completely inappropriate manner, he 'taught' the rest of the world that ‘the Arbeit Macht Frei’ sign on the Auschwitz gates ‘is not a Polish sign’ and that ‘Auschwitz is not a Polish name’ as if the rest of the world is a bunch of dummies. -In February 2018, during his first official visit to Germany, the Polish PM stunned the public by declaring seriousity: “Poland has no responsibility for anti-Semitism in 1968 because there was no Poland, because the country was then occupied by the Soviet regime.” It is an interesting observation by an official and a prime-minister, not an apprentice on a TV show from where he most certainly would be fired in no time. -Hours after his 'historic' remark, Morawiecki took the time to travel outside Munich to attend, with Polish aplomb, nothing else but the grave of members of Brygada Świętokrzyska, the Holy Cross Mountain Brigade, the notorious Polish Nazi collaborators. He also said that he is ‘honoring the Polish patriots’ by his visit, with flowers. -Unlike the nervous president Duda, self-assured prime-minister Morawiecki was absolutely convinced of what he was saying and doing. He sent the message to the world, and the world received it for what it is - that the prime-minister of Poland is an anti-Semite, and that the line of his government is officially anti-Semitic. It is good to know. He has an infuriating patronising tone in his and his chancellor’s comments on the repeating uproars, saying: “we understand Jewish sentiments”. Nobody is interested in this repeated quiet arrogancy. We have heard him clearly. It is time for him to apologise and to keep quiet. The Polish government, meanwhile, is very busy creating a new history, their own version of it - by means of national institutions. The Ministry of Justice has frozen the restitution law, and has prepared the law restricting export of kosher meat. The Ministry of Culture is busy as ever with active replacement of people at the national memorial institutions - such as the Gdansk Museum of WWII, where the Council dissolved recently, and where the new Council will be called soon, with an officially stated purpose Let's be sure ‘to convey the Polish views of the WWII” in the main exhibition of the largest WWII museum in the world..
At the same time, another aggressive campaign on the way and pushed forward by the governmental bodies, is the petition for replacing Piotr Cywinski, the director of the Auschwitz Museum for over 10 years, and replacing him with someone more suitable for the government revisionist history of that important place. There are many local initiatives throughout Poland, on the middle and low levels of its executive power, which bring on more anti-Semitic and historically fraudulent activities weekly, if not daily. Against this background, there should be no surprise at the planning and carrying out of outrageous events - such as the February 24 conference in Wroclaw called “The participation of Jews in the extermination of Jews”. The guest star of that conference is the known Polish vocal anti-Semite Ewa Kurek who actively promotes the concept that ghettos during the war ‘were set up by Jews on Polish territories as a blue-print for the future Jewish state structures’. With regard to the European Union, It is only in Poland today, in year 2018, where such zoological anti-Semites are not being put behind bars - despite the fact that in 1998, Poland signed the law criminalising Holocaust denial. The public phrase of the Polish PM Morawiecki on ‘the Jewish perpetrators of Holocaust” is very close to Holocaust denial and is a conscious travesty of the tragedy of the Holocaust - punishable by the Poland’s own law. it was the Polish government who cancelled the trip of the Israeli Education Minister Naftali Benett who wanted to come to see his counterparts and talk to them on the matter of the notorious law. They did it in a rude and abrasive way, very much the same as the Polish government back in 1938 closed the door to British, French and American ambassadors who were trying to talk sense with them on the matter of their ultimatum to Czechoslovakia. Official governmental media is full of anti-Jewish and anti-Israel bias daily, while they did not report the Morawiecki comment on ‘the Jewish perpetrators of Holocaust’ on the main official TV news at all. The explosion of anti-Semitic hatred is all over the social media, an important part of life for millions of people world-wide; graffiti “HItler did nothing wrong” are on the Polish streets today, as well as leaflets saying “Polish money for Polish hospitals, not Jewish museums”; escalating demonstrations of Polish ultra nationalists. For the first time since 1968, we are hearing that Polish Jews are bewildered and afraid, many of them are as young as 22- 24 and did not know of any problem with their Jewishness in their country until this very moment. At the same time, we are hearing from a senior generation, like the chairman of the POLIN museum legendary Marian Turski that ‘we are living today in 1934 or 1935, and the main question is how to prevent 1939”. We are hearing from the people like professor Pawel Machcewicz that “ I never thought that I would have to run from my own country”,and from stalwart Jan T Gross that he is ‘afraid for my country now”. Everything listed above indicates that in this ongoing process of falsifying the history of the WWII, censoring Holocaust, insulting millions of victims and their families, setting up the new, distorted reality in their own country and trying to project this distorted reality onto the rest of the world, is not the opinion of individuals, but the coordinated policy of the government, legislative bodies and the presidency of Poland, thus making it the official policy of the state. Such official policy, close to Holocaust denial and openly anti-Semitic, is unprecedented for any European and Western democracy since the Nuremberg Trials. And it has to be responded to adequately and swiftly. There have been calls for boycott of Poland . There were many observations on the rapidly widening isolation of Poland which the country brought on itself with astonishing stubbornness. In fact, the behaviour of the Polish state today calls for nothing else but full-weight all-spectrum sanctions against it on the grounds of open racism. This is the time for action. It would be completely wrong to give in to the Polish current official policy by participating in the March of Living in the Polish part of it. It would be a mockery of the meaning of the March and its purpose. It would be utterly wrong and counter-productive to continue to send students there, under the circumstances. It will be impossible to discuss it with this Polish government and their representatives as with equal partners, because they are not. Nowadays, the prime minister of Poland is openly honouring Polish Nazi collaborators. One does not talk with this kind of people. “The heroic character of the Polish race must not blind us to their record of folly and ingratitude which over centuries had led them through measureless suffering. [..]. Now, in 1938, over a question so minor as Teschen ( the area of Czehoslovakia which had been seized by Poland arrogantly and hastily shortly prior to the WWII) they sundered themselves from all those friends in France, Britain and the United States who had lifted them once and again to a national, coherent life, and whom they were so soon to need so sorely. We see them hurrying, while the might of Germany glowered up against them, to grasp their share of the pillage and ruin of Czechoslovakia. It is a mystery and tragedy of European history, that a people capable of every heroic virtue, gifted, valiant, charming, as individuals, should repeatedly show such inveterate faults in almost every aspect of their governmental life. Glorious in revolt and ruin; squalid and shameful in triumph. The bravest of the brave, too often led by the vilest of the vile!” - quoted on the The War Memoirs of Winston Churchill. Part III: Gathering Storm. Published as serialisation, Life Magazine, May 3, 1948, page 73. As we know, those who are unwilling to draw conclusions and lessons from history are doomed. There are no exceptions to this rule. 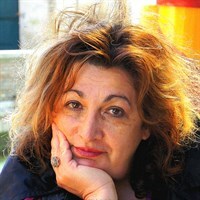 Inna Rogatchi is writer, film-maker, scholar and public figure. She is co-founder and President of The Rogatchi Foundation. Dr Rogatchi is the author of The Lessons of Survival, internationally acclaimed film on Simon Wiesenthal. Her forthcoming book is A View From A Cattle Wagon, collection of essays on the post-Holocaust. She is the author of Outreach to Humanity series of cultural and educational projects of the Rogatchi Foundation, including Shining Souls. Champions of Humanity on heroes of Holocaust.